Grandmaster Chul Koo Yoon, a 9th Degree Black Belt, is the Founder & President of the Korea Taekwondo Academy (KTA) which was established in April, 1974, as an educational institution. The Academy has taught thousands of enthusiastic people of all ages throughout Indianapolis and its suburban areas for over four decades. KTA was founded by Grandmaster Yoon with one main goal in mind: To teach and show the American public the traditional martial art of Taekwondo. Since 1974, Grandmaster Yoon has taught and promoted over 3,000 Black Belts and created several outstanding instructors. A pioneer in Indiana Taekwondo history, Grand Master Yoon was a trend setter of Taekwondo development in the Midwest. He holds the distinction of being the Master and Coach of Indiana’s only Taekwondo Olympian – Cheryl Kalanoc. In addition, he led Master Cooley and several others to national and international successes from the 1970’s through 1990’s. In 1981, Grandmaster Yoon and KTA sponsored and directed the historic event “The 1st Official National Junior Olympic Taekwondo Championships” in Indianapolis. Grandmaster Yoon was one of the first to embrace the idea that our junior competitors would one day be our senior competitors; and that by having a national championships for juniors would cultivate successful results of our senior national team in the future. Although his idea of a Junior Olympics was not initially embraced by several of his peers at that time, he was successful in convincing the leadership of the NGB at the time to move forward with the idea. Grandmaster Yoon considers this one of his greatest accomplishments in the development of sport taekwondo in the United States. In the mid 1980’s, Grandmaster Yoon was elected and served two terms as an officer of the United States Taekwondo Union and also served as the Secretary General of the Pan-American Taekwondo Union. During this time, Taekwondo made its debut in the 1988 Olympic Games as well as the 1987 Pan Am Games (see below) which is considered one of the most important eras to date in the development of Taekwondo. At the 1987 Pan American Games held in Indianapolis, Taekwondo made its debut as an official Pan Am sport. Grandmaster Yoon was the technical director for Taekwondo, and the event was so successful that spectator tickets sold out before any other sport in the Games! Click to View the Official Article from the IndyStar! An icon in Indianapolis martial arts received recognition during the 14th annual Indy Cup Taekwondo Championships at Lawrence North High School. 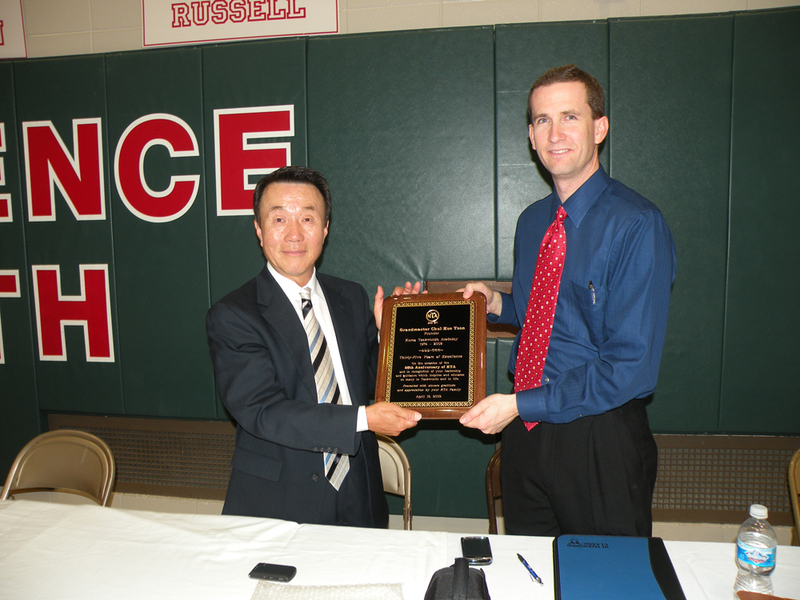 Taekwondo Grandmaster Chul Koo Yoon, founder of Korea Taekwondo Academy, received a plaque marking his contributions to the sport around the world. Yoon, who trained Indiana’s only taekwondo Olympian and was the sport’s organizational director at the 1987 Pan-Am Games in Indianapolis, received the award from KTA Master Instructor Garth Cooley, a world sparring medalist and former two-time national team member. Yoon, a native of South Korea who is retired and now lives in the San Diego area, and Cooley, his former student, have promoted 3,000 taekwondo black belts since KTA opened 35 years ago this month. The April 18-19 IndyCup tournament – which included board breaking, forms and sparring – drew more than 350 competitors from about a dozen states.